If you are struggling with brainstorming, planning, and executing I had you in mind when I created this planner. 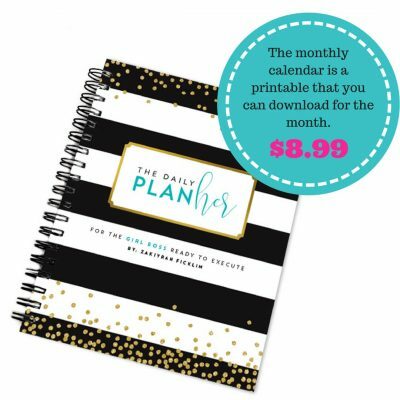 This planner is going to help you sort out your goals and be intentional about executing on them. I want this to be your best year to date. It has been proven that when you write things down you are increasing the overall ability to retain information, reduce anxiety, and increase your commitment level to achieve your goals. Allow this planner to help you build a habit of keeping clutter out of your head and onto your paper to produce results. By purchasing The Daily PlanHer you will have a guide that will walk you through the proper way to set and execute your goals, develop a MIT Funnel (Most Important Things), and help you to develop daily affirmations. Grab your PlanHer today and start organizing your new year. Digital download for one year of planning. This one month planner is just what you need to execute your month.